Thinking of objecting to your revised Capital Value? This week the story that just won't disappear from the media headlines has been the new Auckland CV's (Capital Valuations). Described by Auckland Council as the “most likely selling price had the property (including buildings and all other improvements on the land, excluding chattels) been sold on 1 July 2014”. Now the fact is Auckland is not alone in being exposed to a whole new set of CV's - there are 11 councils that have or will have released rating revaluations in November alone, however the scale of property price inflation in the Auckland region over the past 3 years is what is drawing so much media attention. Accessing this new valuation for Aucklanders has been a headache, and in many ways the archaic approach taken by their digital team to my mind reflects a somewhat archaic approach to the whole process, however that is another story and a separate article! I have decided to object to the new Capital Value ascribed to our house and in doing so I though I would share my thinking and the process as a public service to you as readers. Our circumstances as ever, may well be very different to other people's circumstances, however I think there is value in sharing the principles of the objection. We will have to wait until mid December to see if our objection has been confirmed or rejected. Remember you have to object before the 19th December. Out circumstances are that we purchased our property in the past 3 years since the last revaluation in 2011. This latest revaluation published this week has increased the value of our property by 14% since the 2011 revaluation. We live in Devonport. However the price we paid a year ago was actually lower than the 2011 valuation. This has resulted in our new Capital Valuation which of course is based on the Council's July 2014 notional valuation being 19% higher than the price we paid. I propose to object on the grounds that the value of our property has not increased by 19% in less than a year. It is in my mind irrelevant that the 3 year increase is 14%, what is relevant is recent sale of the property as clear benchmark to notional property value. I therefore have objected on the basis that the new CV should be based on the last sale price adjusted for the general increase in property valuations of property in the local suburb over that time period. The QV website has a suburb specific page within which is a chart which tracks the Median E-Valuer for the suburb going back over the past 5 years. Simply type in the name of your suburb on the home page of the website instead of your address. By hovering your mouse on a date on the chart line you can read off the median E-Valuer price for a specific month. In our case I selected September 2013 at $1,121,700 (we purchased the property in August so the following month figure is the most accurate) and then the July 2014 figure at $1,215,100. I therefore submit to the Auckland Council that our property has appreciated by 8.3% since we purchased the property in August last year. So applying this 8.3% increase to the purchase price lead correctly in my opinion to the view that the “most likely selling price had the property (including buildings and all other improvements on the land, excluding chattels) been sold on 1 July 2014” would be (sale price * 1.083) = submitted revised CV. The process of objection requires you to complete a form online or on paper and by snail mail which can be downloaded from the same page of the Council website. The process requires the completion of the details for the property and then the "Contended Value" (your challenged view of the new CV). This needs to be broken down into the Land Value and the Value of Improvements. I chose to use the Land Value in the new assessment and adjust the value of improvements. The re-valuation of our property at XY Street, Devonport has defined a Capital Value of $A . This assessment is as defined by the Council is the “most likely selling price had the property (including buildings and all other improvements on the land, excluding chattels) been sold on 1 July 2014”. I contend that this re-valuation is inaccurate based on the property having been sold on the <sale date> for a price of $B. The most appropriate method of establishing the “most likely selling price had the property (including buildings and all other improvements on the land, excluding chattels) been sold on 1 July 2014” would be to evaluate the comparable valuation of all Devonport properties in September 2013 (based on sales in August) with that in July 2014, 10 months later. Based on the published data from QV the median valuation in Devonport as reported at 1st September 2013 was $1,121,700 and as at 1st July 2014 it was $1,215,100. This represents an appreciation of value of 8.3% between the sale date of this property and the re-valuation date of 1st July, a period of 10 months. On this basis the re-valuation of XY Street should be Capital Value of $C. I should stress that this is my approach to addresses what I think is an inaccurate re-valuation of our property based on our circumstances. I recommend everyone makes an evaluation based on their own circumstances. I have no idea whether my appeal will be upheld and our Capital Value adjusted or if we fail. I do however believe that this matter is worthy of time and consideration. I do not naturally put myself out there as an advisory or expert. I simply want to highlight this subject and the approach I have chosen to take. I believe this time around as compared to 2011 there are likely to be more objections lodged simply because the inflation in property prices and therefore CV's is far more significant and the knock-on effect on rates is likely to be just as significant. To answer what might be a nagging question you might have as to why I don't just celebrate this somewhat elevated Capital Value? Simply put I have never held much sway by the CV of a property as I have expressed in prior articles. The CV will ultimately have no bearing on the true value of our property; that will be only judged by a future purchasers, whereas Auckland Council want to levy their rates based on a formula which I judge in our situation is inaccurate. The latest batch of property statistics provide what I think is a vital support to the view that the Auckland property market is cooling. A year ago the Auckland market was powering on at a pace. In its September 2013 monthly housing market update Barfoot & Thompson reported year-on-year sales up 14%, with the median sales price up 14%. At the same time the inventory of property for sale on the market as measured by the Realestate.co.nz NZ Property Report slumped to just 11.5 weeks down from 17 weeks a year earlier . Examining each of these key metrics of the property market a year later we will see just how much as changed in the past year and supports the view in my opinion that the heat has certainly come out of the Auckland market. Sales are the leading indicator of property demand and as the chart below shows the trend is down. Monthly sales as reported by Barfoot & Thompson who representing close to 40% of all Auckland sales provide a robust view of the market. Their data shows sales in the 9 months so far of 2014 below the 2013 level for 8 of those 9 months, with the differential if anything growing wider in the past 3 months with September down 13% as compared to a year ago. New listings coming onto the market provide a view as to the confidence in the market amongst sellers and as the chart below shows the level of new listings is down in all but 2 of the months of 2014. From Realestate.co.nz data total listings across the Auckland region in the first 9 months of 2014 amount to a total of 30,449 as compared to the same 9 months of 2013 at 32,484 down 6%. With sales in the first 9 months of 2014 down 12% and the level of new listings down 6% it would come as no surprise to see that the inventory of property for sale has been rising in 2014 as the chart below demonstrates. This metric of inventory of property on the market uses the current rate of sales to estimate the time it would take in theory to sell all the property on the market at the end of September. It certainly shows a significant improvement in the weeks of inventory. In case you were wondering if the actual number of listings was higher this year than last year the chart below will answer that easily. It may not be as significant a rise in inventory but there are more properties for sale at the end of September this year than last and of course fewer are selling. Sales price tends to lag sales volumes which tend to reflect demand and supply as measured by inventory and new listings. 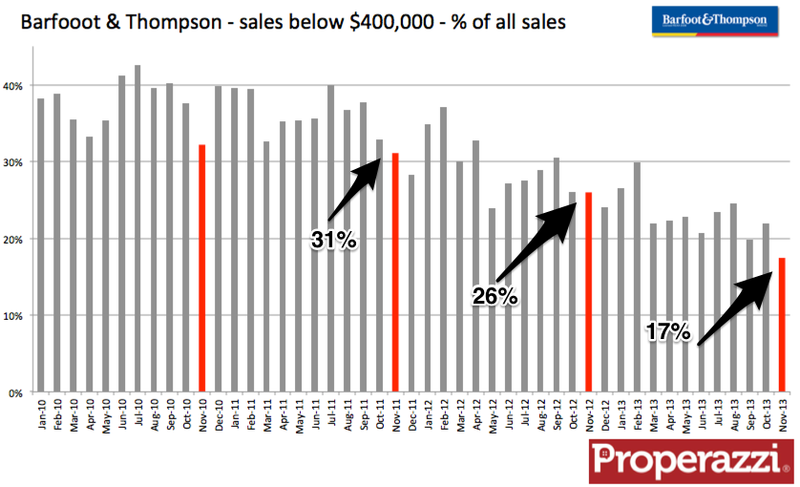 The chart below based on Barfoot & Thompson median sales price indexed to the January sales price in each of the past 3 years shows a strong start to this year but since April the median price has hardly moved with the September level barely up on August. So in summary. Sales are down, new listings are not flowing onto the market as sellers lack confidence, this is lessening any pressure in the market from buyers who are subdued and as a consequence the pressure of constrained inventory has lessened and this has signalled a plateauing of property sales price. In short - the heat has come out of the Auckland property market. Trade Me Property today released a new competitive attack on its rival Realestate.co.nz with its inaugural Property Price Index. This report provides insight into the trends in asking price by region and also by property type. In my view vital information from a credible source that will be greatly appreciated by the real estate and financial community. In launching this new report Trade Me Property has literally picked up the baton from Realestate.co.nz - a baton it seems Realestate.co.nz was only too happy to relinquish, but this may turn out to be a decision it comes to regret in time. The NZ Property Report from Realestate.co.nz was conceived of over 5 years ago and has become a vital insight into the supply side of the property market, data that was quoted and reviewed by financial institutions and real estate industry as well as the media. Sadly the last 12 months and especially the last 6 months has seen less and less effort focused on the report by the management of Realestate.co.nz. The lack of focus started with the timeliness. When it first came out and for the first 3 years it was published on the 1st day of each month and the media become accustomed to this information which built brand profile and credibility. Latterly however it often took until the 15th of the month before being published. Added to tardiness was incompleteness and lack of openness. The release of the monthly information ceased to be a complete report and became simply a press release and just last month the data was not even published online and no access to the raw data has been made available. At this time the online source still only shows the July report. Clearly Realestate.co.nz attach little importance to being judged and viewed as a respected knowledge base and thought leader - that is the baton that Trade Me Property is grasping. So what is there to like about this new report from Trade Me Property? As with all things from Trade Me there is a simplicity and clarity of communication I admire, clean graphics aid comprehension. However the real value is in the detail. They are the first source to have segmented any property information by property type. To describe NZ property sales price by one number when that number is made up of such a variety of differing house sizes and types from apartments to townhouses and units is too simplistic but that is what all the other source do - be it REINZ or QV. Trade Me Property Price Index details the typical listing price for 1 & 2 bedroom houses as compared to 3 & 4 bedroom houses and the trend over the past year. Who would have thought that within the headline price of property in Wellington rising at an annual rate of 6.8% that large 5+ bedroom homes are down 5.2% over the past year. The overriding benefit of this report is timeliness, being produced on the 2nd day of the month - ahead of all other property reports on the September data. This is how it should be as a property portal has the data at its finger tips to compute and present in minutes. As to future wishes. I hope the raw data will be published so those organisations who have found the Realestate.co.nz so valuable will have access to this alternative data which is potentially more comprehensive as it features private listings as well as licensed agents (of course the boycott of Trade Me Property by some agencies may still limit their ability to represent the whole market but statistically this data should be representative). It will also be great to get more granular data so people can see the trend in listing price for a suburb and for 1 & 2 bedroom houses in a particular suburb over time - now that would be great. In my view Trade Me Property has made a smart move and Realestate.co.nz have dropped the ball - let's see if there is a reaction and Realestate.co.nz realise how important this move has been. Just how unique is the NZ Property Market? I read these articles and accept the often highly respected authors for their bullet-proof assertions. Clearly we must be unique in the world and standing by as we witness house prices spiral out of control as according to a recent Gareth Morgan article in the NZ Herald “New Zealand is unusual in the world in that it pretends housing isn't an asset like bank deposits or company shares”. Again I respect Gareth Morgan as a credible economist and a broad thinker, I may not always agree but I do respect his views. So set against this backdrop of opinions and analysis I decided to seek out some data to compare NZ with other countries. The natural partner for comparison are the markets of Australia and the UK. I am grateful to the assistance of an excellent UK property commentator who helpfully pointed me in the right direction for UK data, thanks Henry Pryor. The UK data provides a mix adjusted house price index which mirrors the REINZ Stratified House Price Index and fortunately the data extends back into the 1970’s whilst REINZ data goes back to 1992. Using the index of the 1st quarter of 1992 as the base the two markets track through the next 22 years in what is a surprisingly aligned growth path matching each other for the 22 year rise of 280% to both reach the index level of 383 in the 1st quarter of 2014. It is worth remembering that the UK has capital gains tax, inheritance tax as well as stamp duty - none of which seem to have either depressed that market nor preferenced the NZ market by comparison. If we add in Australian data which provides a valuable benchmark of a similar country albeit of greater scale closer to our trading partners of Asia and the US. Australian data is not accessible back 20 years but a comparable Property Price Index is available from 2002. Given the property bubble that all markets experienced in the mid 2000’s I decided to approach a comparable index for the three countries not on an aligned time period but rather indexed on the starting point being the peak of their respective property price index before the property crash caused by the GFC in 2008/9. For NZ property prices peaked in the 3rd quarter of 2007, the UK peaked in the final quarter of 2007 with Australia in the 1st quarter of 2008. What transpired next is ably demonstrated in the chart below which shows the shallow fall experienced in Australia before a very strong recovery at a time when the UK and NZ markets continued to weaken. The UK market suffered the worst seeing the index fall 18% before rising whilst NZ fell 10%. It took Australia just 5 quarters for prices to recover from the peak of the pre-GFC collapse compared to 4 years for the UK and close to 5 years for NZ. Subsequently all 3 markets have experienced resurgent price inflation that now sees the Australian market 26% up on the prior peak of 2008 as compared to 16% and 18% rises for the UK and NZ respectively. Such clear alignment of pricing trends despite the very different tax policies designed to milk the property market or stimulate the property market would seem to point to the view from the analysis that the NZ property market is not that unique, if anything it is incredibly similar to these other markets and despite the best intentions of politicians the market would seem to move aligned to factors well outside of such policies. I hope I can be forgiven for focussing repeatedly on the Auckland property market. I know there are other regions of the country and they have quite unique property markets impacted by factors far removed form those of Auckland. The fact is though, that Auckland is the largest region, accounting for around 36% of all sales nationally added to which the data for Auckland is just that bit more comprehensive. Up until now the analysis I have undertaken of the Auckland market has been restricted to seeing it as one market, however the data is available to analyse the region across what are still recognised as the historical boundaries of North Shore, Waitakere, Auckland City and Manukau. So I have crunched the numbers to paint a clearer picture of what has been going on across these four regions over the past 6 years. As a reference point I undertook some evaluation of the multiplicity of property data on the Auckland market recently and determined that the key data was the REINZ Stratified price index and the QV valuation index. However when it comes to the regional data there is no stratified data published by REINZ so I have used the median price data calculated on a 12 month moving average. This method provides a clearer view of trends. But before looking at the price trends, let's start with volume sales. On average 2,100 sales a month are completed across the Auckland region with Auckland City representing the largest share at 39%. In terms of sales trends over the past 6 years I have indexed sales to the 12 months moving average to January 2008 at 100. As can be seen the most active region has been the North Shore which rebounded first and most significantly from the property crash and has gone on to lead sales growth over the past 6 years. Having said that it was also the first region to peak in September last year and is now closing in on the same sales levels as 6 years ago. The Waitakere region has seen a very strong growth in sales over the past 2 years although sales peaked in December last year and now have slipped below the base of January 2008. The performance of the Manukau region is the weakest of the 4 regions suffering the largest fall off through 2008 and then again in 2010 and has not attained the level of sales achieved through the 12 months to January 2008. In terms of price appreciation I have used the same method I use for the Property Dashboard which is to calculate the variance between the current 12 months moving average median price and the prior 12 months moving average median price. The chart below tracks the 6 years from January 2008. The most significant region is Waitakere which has witnessed a recent marked rise in property prices starting in December 2012 at 5% year-on-year growth and rose very steeply for 12 months to hit 20% year-on-year growth before tailing off in the past 6 months. The other regions have equally seen price appreciation rises of up to 15% over the past 2 years although all have seen a tailing off of growth. As with sales performance the Manukau region continues to lag the other regions of Auckland. The latest set of data released by the Real Estate Institute provides a further update on the state of the property market around the country. I have taken the details of sales volumes and prices and inputed them into charts to provide some clarity around the key trends and what that can tell us about the current market and the outlook for the next year. In terms of property sales the number of sales per month keep slipping - 5,893 properties sold in July, down 13% as compared to July last year. This takes the total for the first 7 months of the year to 42,057 as compared to the first 7 months of last year with a total of 47,423 a decline of 11%. 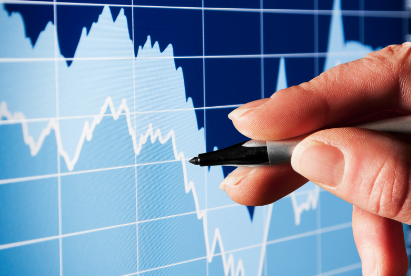 The market peaked in October last year when the moving annual total hit 80,677. The current moving annual total has slipped to 74,753 as shown in the chart below. Property sales are the lead indicator of the market and as such tracking a trend in sales is key to the potential future outcome of the market in price movements. As such the next chart is important as it looks at a 3 month moving average period of sales data. This is showing a change in the trend in sales volumes as the rate of decline is reversing and potentially in a couple of months we could well be seeing year-on-year increases again. The factors behind this reversal of the decline in sales is a shift in the balance between the positive effect of the broader economic growth pitched against the financial constraints placed upon the market by the combination of LVR and rising interest rates. There is no doubt that the latter has had a major impact on sales coming as it did (far from coincidentally) starting in October of last year. However I suspect that the improving sentiment around recent references to delays in future increases in interest rates and potential loosening of LVR policy may be bringing about this reversal with the underlying economic strength winning through. Pricing as stated earlier is more of a lag indicator of the property market and this is seen in the latest set of statistics of the Stratified Median Price Index from REINZ. The data is reported monthly for each of the main 3 metro areas as well as the whole of NZ and the balance of the North Island and the balance of the South Island excluding these main cities. Detailed below are the chart for each of these 6 views of the property price trend covering the past 7 years tracking the latest data for July matched to the peak of the market pre-GFC and the bottom of the market in late 2009. Auckland property prices - so much data! There are now 6 separate sets of property price measures for the Auckland market. All of which are seeking to provide an insight into the trend of price across our largest city. This barrage of statistics published in our daily newspaper is enough to confuse at best, and paralyse at worst, the most ardent of property buyer / seller / investor and even agents! 2 July: Barfoot & Thompson - Auckland's biggest real estate agency has this morning released sales data for June, showing a slight decline in sales volumes but average sale prices up $11,088 in the 30 days - which equates to a daily price rise of $369.60. 7 July: QV - QV said the Auckland region as a whole had increased 2.7 per cent over the past three months and 12.3 per cent year on year. 14 July: Realestate.co.nz - The country's largest house sales website showed Auckland's asking price hit a new all-time record of $732,240 last month. Fair to say that an average person could walk away from reading these reports from the first 2 weeks of the month with a sense of confusion as to which set of data to trust and belief. Sure they all point to rising prices and some speak to hitting a peak, but the margin of increase varies considerably as does the indication of a trend. Charting these separate measures produces a chart that is worthy of some analysis and commentary. First let me explain the format of the chart. All of the price data has been indexed to a base of January 2008 = 100 and all monthly data has been computed on a 12 month moving average which makes it easier to view in terms of trends and also excludes the seasonality that impacts all property stats. As you can see there is a fairly significant disparity between the highest index in June (REINZ median price at 136 as against the lowest being the Realestate.co.nz Asking price at 126. Equally as you will see the path of the index through the property crash in 2008/9 saw some of the measures drop by 10% (QV) whilst others barely dipped into negative (REINZ median price). Examining each of these as to their composition provides a method of evaluating the value and relevancy of each. This measure is actually the odd-one-out within this group as it measures the advertised price or advertised search price of property coming onto the market, whereas the other sets of data analyse the outcome of sales. A noticeable aspect of this measure is 'consumer sentiment' which tends to result in over estimated values in down-turns and under estimated values in up-turns. This may seem counter-intuitive as you would expect to see over estimation of value - the 'over-inflated expectation of sellers' in bubbly markets as we have been in in Auckland. The reality though is that whilst the vendors may genuinely have inflated expectation, their agents tend to price for search online at more conservative levels as we have seen recently. So tracking the path of the index of Realestate.co.nz Asking Price shows it currently tracking at the lowest of the 6 indexes over the past 6 years. The data from Barfoot & Thompson whilst not reflective of the whole of Auckland is more timely than the others and with close to 40% share of the Auckland market and representation in all suburbs, does afford it credibility. The average sale price though is an imperfect measure of property prices as it is open to skew if the composition of sales in a month changes significantly. For this reason Barfoot & Thompson has started publishing a median price which is a more statistically valid measure of property prices. It is though interesting to see that the median price has crept ahead of the average price over the past 2 years. This situation would tend to occur when sales volumes of extreme high value properties slows in proportion to other segments of the market. This though would seem to be contrary to the data which shows $2m+ properties have doubled in each of the past 2 years, whilst sales of sub$400k priced properties have fallen off. More likely is a situation where the majority of sales in the $500,000 to $1,000,000 bracket have edged up significantly driving that median from $450,000 to $625,000 in the space of just over 3 years. The data collated by the Real Estate Institute is the most comprehensive and timely data in that it aggregates sales records from its members as licensed real estate agents who account for around 90% of all transactions each year. The data is of unconditional contracts and thereby is recorded closer to the date of transaction than settlements registered at LINZ and utilised by QV for their data. The REINZ median sales price has been reported monthly since 1992 and is one of the most complete data sets for the whole country. However as presented in this chart, the index is the highest of all the data sets presenting what from outside would seem to be an optimistic view of property prices as it hardly reported a dip in sales price in 2008/9. 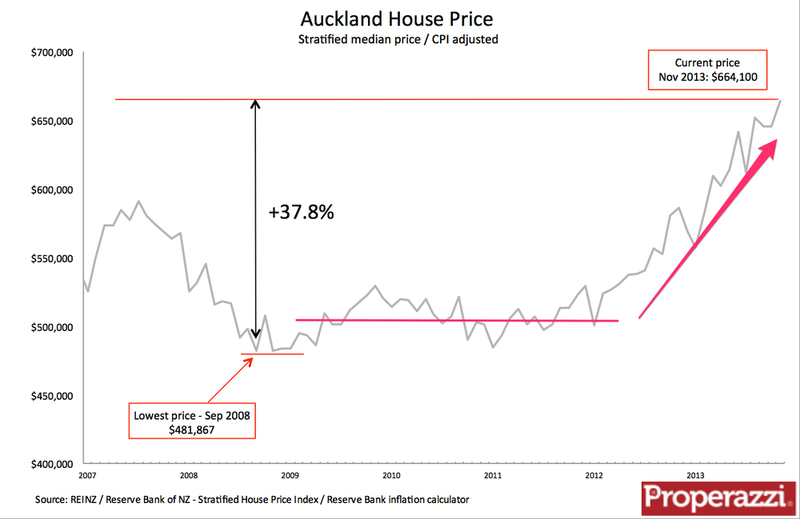 The reason that the median price in Auckland as reported by REINZ is so out of kilter from the other metrics is exactly the reason why REINZ implemented the Stratified Median Sales Price in 2010. The Stratified price index makes adjustments within the market to ensure the composition of suburb sales is representative when the market tends to skew towards certain suburbs as has been the case in Auckland over this 7 year period. For this reason the Stratified price index provides a much more accurate representation of true price movements and the trend on the chart certainly bears this out. The data from QV is in many ways the most accurate, yet it does suffer somewhat from lagging the other data sets, requiring as it does the data from property settlements and title changes to be registered at LINZ. Something that largely happens online nowadays and thereby removes some process time delays. The data is not reported as a median or stratified median but is analysed to assess the actual sales price of each property sold against the estimated property valuation that QV has on record for every property in NZ. So their system and the resulting valuation index is a closer evaluation of the trend in core property values and takes into account the improvements and developments that are undertaken on properties that do materially effect the value of a property which are not accounted for in any of the other data sets and can cause skewing of data. This factor has been a driving component of the Auckland property market for many years as the pace of gentrification of the inner suburbs has seen extensive renovations drive enormous price movements. One of the benefits though of these numerous data sets of property prices in Auckland is the ability to see the variance between these data sets on the chart and also to provide the ability to visually see the the set or sets of data that are in someways the midpoint and therefore the most likely to be the most accurate. From my reading of the data this would be the QV valuation data and the REINZ Stratified median price. Both of these data sets benefits from computational analysis by qualified and trusted professionals. In the case of the REINZ Stratified price with the assistance and guidance of the Reserve Bank and in the case of QV the professional teams of valuers and the resources and skills of Core Logic. What I find very interesting is that it would appear that the Barfoot & Thompson median price data tracks very accurately to the trend of these other two. It may still be a bit too early to tell for sure, but the indication is clear. This could well be the result that Barfoot & Thompson sales are a true representative sample of Auckland property without extreme outliers. The current Property Dashboard has proved to be of great value to buyers, sellers and agents alike as over the past 15 months it has grown to be one of the most accessed (and thereby hopefully valuable) parts of this site. However I have felt that whilst its simplicity of design has been appealing, its measure of the market based purely on inventory was somewhat limiting. To really get a sense of "what's happening in the property market?" needs a view into two other key metrics to add to the available inventory of properties on the market. These are the pace of the market and the trend in prices. I have therefore undertaken an upgrade to the Property Dashboard and extended it from a single gauge to 3 gauges. I have at the same time undertaken more analysis of the 5 years of data from Realestate.co.nz from their monthly NZ Property Report and the REINZ data for the same 5 year period to ensure the segments of each gauge reflecting the Stable Market / Declining Market / Heated Market are reflective of the current state of the market. An important differentiation of the new Property Dashboard is that the core data-set for price trend and pace of sales uses 12 months moving averages. By use of this measure, the dashboard will not present erratic swings month-by-month but will reflect a trend that can be seen month-on-month providing a better evaluation of the current state as well as the emerging trend of each market across the country. The new Property Dashboard is published for each of the 16 regions of the country for where consistent data is available from REINZ and Realestate.co.nz. Unfortunately due to changes made to the monthly reporting by REINZ, regional data for dashboards of the Coromandel region, the Wairarapa and the Central North Island regions are no longer available. The Property Dashboard will be updated monthly upon the release of the relevant data from REINZ and Realestate.co.nz which is likely to be around the middle of the month. Housing Crisis / Property Bubble - what does the data tell us? The term "Housing Crisis" has been the standard text of many news articles in the past week - a quick Google search reveals the extent of the coverage and the political mud-slinging. Now, whether or not there really is a crisis regarding the availability of houses or if we are seeing a bubble in property prices is always a matter best explained and rationalised after the event, never during it. This leads me to ponder the old adage of "What can we learn from examining history?" and equally the wise comment "Past history is not a certain predictor of future trends". However despite these cautionary words it is useful to examine the history of property data, in the context of which, history covers in relative terms a fairly short period; for accurate factual data of property selling prices goes only back to 1992. Since that time we have had a monthly median sales price reported by the Real Estate Institute; that's 22 years of data which does at least cover a couple of key cycles, most significant of which in price terms was the period from 2000 to 2009. During this period of 9 years we saw the national median price (measured on the Stratified House Price Index) to more than double from $174,850 to $344,566. The key questions is whether the current bull market witnessed since 2009 is in anyway a repeat of history? Certainly that slope looks very similar and can be seen to some extent to be accelerating over the past year. To attempt to answer this question, I have compared on an index basis these two periods and overlaid them on the same chart. For the national picture the chart below tracks these two periods with the 2000 - 2009 period represented by the grey line and the recent 2009 to date represented by the red line. Into the 5th year of this bull run the national median sales price is up 21%, this compares with a rise of 52% over the earlier property bull run at the start of the last decade. A case of the circumstances looking similar but actually the extent of the rise being nothing like as significant. However when I thought more about this analysis a question struck me, which is as to whether indexing is appropriate a measure after all a 10% increase on $200,000 is $20,000 whereas a 10% increase on $400,000 is $40,000 and I know which capital appreciation I would prefer to have. So to answer the question, the capital appreciation over the early part of the last decade representing that 52% increase was $91,250 and the most recent rise of 21% represents an appreciation of $77,821. The chart below more ably demonstrates this. So there appears to be a lot of similarity in capital gain between the current bull run and the last bull run - half way through the cycle if history were to be repeated, it would seem. However this is where the rich data available can provide a very different view as to forecasting the coming years as to whether future capital appreciation will match the past decade. For although the national picture shows a striking similarity in capital appreciation thus far the components of the key regional markets highlights a very mixed story. The REINZ Stratified House Price Index only covers the main 3 metro areas and then provides a figure for the North Island (minus Auckland and Wellington) as well as the South Island (minus Christchurch). Here below are these respective analyses of capital appreciation for the period of 2000 to 2009 and 2009 to date across these metro and provincial areas. Auckland we all know is cited as the driver of the current NZ property bull market, but would you have imagined for a moment that it is outstripping the performance of the last bull run? In just over 4 years the capital appreciation of the median sales price is $198,355; after the same period at the start of the last decade it was $132,810. There was certainly a hesitant start but that capital appreciation has been rolling along at a fair clip for the past 2 years - those two lines are certainly diverging more and more. It probably come as no surprise to hear that the capital appreciation for the Wellington market is less than Auckland, however the extent to how much lower may surprise. After just over 4 years the capital appreciation of the median sales price in Wellington is $28,582; after the same period at the start of the last decade it was $84,035. You could, looking at the chart even question the security of that accumulated capital appreciation - just 4 months ago to amounted to $65! The Christchurch market, very much as a result of its own set of unique circumstances has been cited as the partner to the Auckland market in driving the bull run of house sale prices nationally. Well the data certainly bears that out, not quite as extreme as the Auckland market but keeping very much inline with the last bull run. After just over 4 years the capital appreciation of the median sales price in Christchurch is $107,982; after the same period at the start of the last decade it was $92,185. This set of data comprises what remains of the North Island excluding Wellington and Auckland which is a large part of the North Island property market. It does cover the Waikato region including Hamilton as well as Tauranga, the Hawkes Bay, Taranaki, Northland and Manawatu / Wanganui, a very diverse range of property markets. It will though come as no great surprise to see that these collective markets being more of provincial New Zealand, have not experienced a bull market for the past four and a half years. Over this period the capital appreciation of the median sales price across these provincial North Island centers is $16,820; after the same period at the start of the last decade it was $67,225. There is certainly a lot of similarity between the Wellington market and the rest of the North Island excluding Auckland, further reinforcing the fact that this bull run is very centric to the two major cities. Excluding Christchurch from the South Island still leaves a reasonable property market with Otago as well as the Nelson / Marlbourgh region, the balance of the vast Canterbury region and of course Central Otago comprising that unique market of Queenstown. This aggregation of provincial South Island has benefited somewhat better in the past four and a half years than their North Island counterparts recording a capital appreciation of the median sales price of $37,426; after the same period at the start of the last decade it was $92,550. Clearly this region enjoyed a strong bull market in the past bull run, this time however the markets seem more subdued. What can we glean from the April property market data? The most noticeable component of the monthly summary from the Real Estate Institute for April was how conspicuously it lacked any great hyperbole. The facts were clear - sales volumes continue to fall and the fall was significant in the month, down 22% from March and down 20% year-on-year. The fact is that sales volumes have been trending down since they peaked in October last year, reaching 80,677 on a moving annual basis. Since then they have fallen 4% to a moving annual total of 77,151 including April. The April total of 5,670 sales was as the Institute stated the 7th lowest April since the data commenced over 23 years ago. I would go as far as to say that there were extenuating circumstances that partly accounted for the fall in sales. The Institute did reference the coinciding of school holidays and Easter and its effect on working days. I would judge that the key coincidence was the fact that the Easter week ended with Anzac day thereby creating two sequential long weekends and a very short 3 day business week which was a chance for people to escape in the last rays of summer as they did. The last time this occurred was in 2003 when the impact on sales was equally significant - April 2003 saw a 1% fall year-on-year coming off a sequence of strong months in January / February / March of that year respectively +21% / +11% / +11%. By comparison 2014 saw January year-on-year sales down 4%, February down 8% and March down 10% before the April fall of 20%. Out of interest May 2003 saw a rebound with sales up 25% year-on-year. It could be that we may well see a rebound in May this year. The fact is real estate agents are in many ways more influential in the marketing of property these days than a decade ago. Action was noticeably focused to getting listings onto the market in early March coupled with the avoidance of auctions and other time-bound campaigns ending around the Easter period. This did in some way help to deliver what was actually quite a strong March. In terms of price data the median price fell in April from a record high set in March of $440,000 to $432,250. The more reliable Stratified price edged a small increment higher from it's peak in March of $447,003 to $447,646. As has been discussed recently there have been questions asked as to the true indication of property prices as represented by these two measures given the artificial inflation of median price as a consequence of the significant decline in sales of low value property. On a year-on-year basis the sub $400,000 price bracket saw sales decline by 32% - far in excess of the 20% decline in total sales in the month. This factor is clearly impacting the true measure of property prices for just as the composition of sales is changing away from sub $400,000 properties, so it is skewing towards the $1m+ properties which grew by 14% year-on-year thereby exerting a larger influence on the median. Gradually the impact of the this slow sales of lower price property will be reduced and the median price measure (either in raw form or stratified) will begin to reflect the true selling price of a representative selection of property sales. At that time and I believe the April figures are for the first time beginning to reflect this, we will likely see some easing in property prices, clearly showing that the market peaked in price and sales volumes back at the end of 2013. How can the median price be rising when property sale prices aren't rising? The reason behind these statements is the conflicting data coming out from REINZ and from QV - specifically the March median price data which showed an accelerating rise in price from 8.2% year-on-year growth in February to 9.2% in March set against a fall in sales of 10% and QV reporting that the rate of price increase was easing. In a single month REINZ reported the median price of NZ property had risen from $415,000 to $440,000! There has even been questions as to the accuracy of the REINZ data. This is not something I believe, or have any insight into, but such comments certainly demonstrate the concern in the market as so much value is attached to the timely and accurate indicators of the property market by so many sectors of the economy. I have long advocated the use of the REINZ Stratified Median price index as a more accurate methodology for tracking the true indicator of the price of property sales across the country, however even this measure, long trusted for its lack of volatility has of late shown some wild fluctuations. Tracking these fluctuations over the past 20 years as the chart below highlights shows that on a 3 month moving average basis the recent decade has shown a normal fluctuation range of around $3,900 from month to month, this was a higher level of volatility when compared to the 90’s when the volatility was less than $1,700 month to month. In the last 3 months this volatility has spiked with the 3 months average for the 2014 year so far showing a volatility month-to-month exceeding $11,000 - a highly volatile situation. So why is it that we are seeing this volatility? In my opinion the impact of the LVR restrictions are having a greater impact on the property market than is currently being acknowledged. Sales of lower priced properties are down - the data is reported by both REINZ and in the Auckland market by Barfoot & Thompson. Overall property sales have already come off their peak and are easing - 10% down in the year to March. The retail banks have demonstrated an ‘over-correction’ to the Reserve Bank imposed 10% criteria for high LVR lending, resulting in upwards of a 90% fall in the approval of 80+% LVR mortgages. To better assist in understanding how these indicators might be contributing to the volatility in the median price I have developed a hypothetical scenario of the composition of the property market sales in a month. The by comparing this with a subsequent month where the underlying property prices remain the same year-on-year across all price sectors, where sales volumes remain unchanged across all price sectors, with the exception of the lower priced end of the market and let me show the impact. Now let’s jump forward to March 2014 - let's reduce by 23% the sales volumes in the price ranges $225,000 to $400,000 - just these price ranges. All other sales volumes by price range remain identical to the year earlier. The outcome of this impact (the hypothetical impact of the LVR restriction) is shown in the chart by the marginal sales reduction in red across those price ranges. That 23% fall in sales across those lower priced properties segment leads to an overall 10% fall in total sales to 4,567. The median price though went up by 8% to $431,000 and the average price went up by just 4% to $528,000. This model is designed to demonstrate that what we could be experiencing is two components of the property market working in complete isolation. The majority of the property market is plodding on unaffected with the no change in year-on-year sales volumes, and not experiencing any price appreciation. Whilst in those sectors directly affected by the LVR restriction the sales volumes have dropped by 23% but equally with no price change amongst those sales. The net effect though is that the signal being sent out to the market through the median sales price is that property prices overall are rising in an inflationary manner. A classic situation where aggregated statistics belies the true situation. In a heated property market do sellers’ price expectations become inflated? It is a commonly held view that people looking to sell their home and agents that act on their behalf, have a sale price expectation way ahead of the reality of what buyers will actually pay. It is logical. Why would a seller not pitch a price at least a bit above what they would expect to get. Additionally in a heated market one would expect these expectations on the part of sellers to become further inflated to the point of outright greed - Right? Well it seems that in general across NZ, sellers seem to be demonstrating restraint and setting a price expectation that is actually moving close to the selling price - or seen from the other perspective buyers appear to be paying closer attention to the price expectations of sellers! Is sanity creeping into the property market? Here are the facts based on the last 7 years - a period that started as the property bubble peaked in 2007 and has taken us through a property crash and a property resurgence. Over the past 7 years the median asking price as analysed by all new listing added to Realestate.co.nz has risen from $400,000 in January 2007 to $495,000 in March 2014; whilst the median sales price as reported by REINZ has risen from $327,000 to $440,000 last month. As would be expected the asking price has remained ahead of the selling price, but that margin has actually decreased over the past 7 years from a premium of around 205 to 25% to nowadays around 15%. UPDATE: I have at the request of a commenter added this modified chart of the variance of asking price to sales price using 12 month moving average data thereby removing any seasonality. This trend is very clearly seen when the data of asking price and selling price is tracked on an index basis where the January 2007 data is set at 100. Here the rise in the median sales price can be seen growing faster than asking price over the past 7 years. Asking price in the last 7 years has risen by 23% as comparing March 2014 with January 2007 whereas sales prices have risen by 35%. The most recent 3 year period at least has seen a very strong sellers' market where inventory levels have been historically low coupled with low finance costs and ready access to lending, this has created the most recent property inflation spike which has set the media alight with expectations of a bubble. Such media coverage tends to invoke the 'herd mentality' which creates an environment where buyers loose negotiation leverage as the power switched to sellers - buyers then have to accept that they need to pay to secure a property they want or fear loosing it. The most recent changes to the Real Estate Agents Act came into force in 2009 and one of the requirements of the Act was to require all agents when undertaking an appraisal and before a signed License Agreement is completed, to provide the vendor with a written appraisal document which must include an indication of expected appraisal price for the property. This price is then often used as the listing price for website search range - the 'hidden' price which drives the search engine of the website without a specific price being published. This requirement of the Act is likely to have driven a behaviour amongst agents to be more accurate (and thereby less inflated) in estimating a sale price. In someways as a follow on from the last explanation, the last 7 years has certainly seen a significant change within the real estate industry in the appreciation of the role of the web in property searching and discovery. As this transformation has occurred agents have come to realise the importance of the price ranges and this may well have lead to asking prices entered as search prices being set to optimise the exposure of a property when people are searching. Whilst this alone may not have caused this narrowing of the gap between asking price and sales price, in the early period of the last 7 years the likelihood was that most agents delegated the task to office admins who may have been given a range of price search and taken upon themselves to enter the range of a specific figure. Most agents use one of the automated appraisal tools offered by Terralink with Property Guru or Property IQ offered by Core Logic - both of these are themselves powered by the database of settled sales from the LINZ database. This database is on average at least 3 months older in terms of data than the REINZ sales data which could cause a lag effect therefore depressing the potential price inflation factor evident in the market. In my view it is likely that all of the above could be contributing to some degree to this trend of a convergence of asking price and selling price. 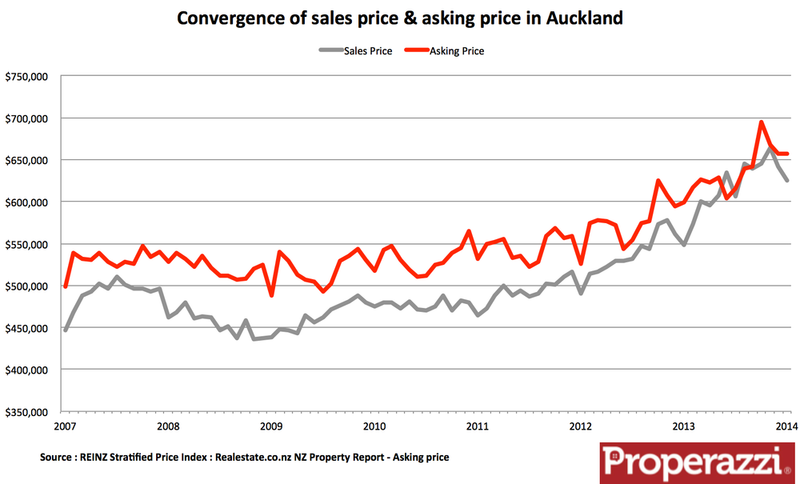 I certainly don't expect them to converge however they are both key indicators of the property market with the measure of asking price being correlated to property sales as I analysed a couple of months ago in relation to the Auckland market. Do rising mortgage rates depress price appreciation? Just last week I undertook a detailed analysis of property sales and property prices for the past 20 years and matched them to the movements of mortgage rates in the article "Mortgage rates on the up - what will be the reaction of the property market? I refer to your graph entitled Rising mortgage rates generally depresses price appreciation. I contend that the data indicates that for the first 3-4 years of the 5 year period displayed, median prices continued to increase, perhaps conservatively by 10% year on year. I don't have the raw data but it would be very interesting to overlay the 2 data sets and create a single line. My point is this. The Reserve Bank just started increasing rates from all time lows. Historically your data indicates approx. 10% median increases in property prices for 3-4 years thereafter. So my conclusion is the opposite to yours, and price appreciation will occur, to the tune of 10% p.a. over the next 3-4 years in the absence of any major economic setback. Factor in Improving employment, Canterbury rebuild and Chinese investment and you have a glass half full situation in my opinion (if you own real estate). The graph to which he refers is this one tracking the periods of 1994 to 1997 and 2003 to 2008. My contention as I stated in the article was that during these periods when mortgage rates were on the rise property price appreciation was depressed. Not that prices fell, just that price appreciation was curtailed. As per the recommendation of the writer of the comment I have redone the chart to align the two periods on split axis. I would agree, that the fact is, that given the historical experience of mortgage interest rates being raised whilst property prices have been growing at a reasonable rate the impact is not to instantly depress price appreciation, rather as the chart would seem to indicate the market adjusts. It is possible to argue that the reaction of the market is to mark-time for the first year as interest rates are raised, then adjust to a lower rate of appreciation for anything from 2 years to 4 years - that is all the data that is available. Apply this analysis to the current market it would be possible to support the writer of the comment and suggest that the likely trend in prices is to see a continuation of the current rate of price appreciation of c.10% per annum for the next 3 - 4 years. Mortgage rates on the up - what will be the reaction of the property market? Last week we witnessed the first increase in the OCR since July 2010 when the rate was then raised from 2.75% to 3.0% - that change was short-lived as in March of 2011 it was dropped to 2.5%; a level it has maintained since. The fact is that the current levels of interest rates, which have been pretty much stable for the past 5 years represent an unprecedented period of low interest rates. A quick look back in history shows exactly how the past 5 years contrasts with the volatility of the past 50 years. Historically mortgage rates have experienced typical cycles of rises and falls, especially over the past 25 years, with rates topping 20%+ at the end of the 80's. To put that into perspective a 30 year mortgage for a median priced $415,000 property which today based on an 20% deposit costs $1,948 per month would cost $4,198 at 15% mortgage rates and a staggering $5,684 per month if we were to experience the 20.5% mortgage rate of June 1987 again! We are certainly going to have to adjust our expectation as mortgage holders to paying more a month in the coming years as the trend is upward. The recent 0.25% increase added $53 to the monthly cost of a 30 year mortgage of the median priced house. Of equal concern to most home owners with a mortgage is the likely impact these rises in mortgage rates will have on the property market, both in terms of levels of activity and price. Whilst data from the Reserve Bank on interest and mortgage rates goes back 50 years the data on property sales and prices from the Real Estate Institute only goes back 20 years, however the past 20 years does provide us with some valuable data as to the property cycles of the period for analysis. The chart above tracks floating mortgage rates since 1992 and as highlighted by the coloured sections, this timeline does showcase some parallel periods of rate changes which can provide a basis for analysis. Rising interest rates - The red sections "A" - this occurred between March 1994 and September 1996, a period of 31 months. A similar rising interest rate period was from October 2003 to July 2008, a period of 58 months. Falling interest rates - Green section "B" - this occurred between April 1998 and August 1999, a period of 17 months. A similar falling interest rate period was from August 2008 to July 2009, a period of 12 months. Volatile interest rates - Orange section "C" - this occurred between September 1999 and December 2001, a period of 28 months. A similar period of volatile interest rates was from February 2002 to September 2003, a period of 20 months. So taking these three defined parallel periods of activity it is very interesting to see what happened to property sales volumes and prices during these times. The two periods of rising interest rates were lengthy and progressive and both covered periods when economic activity was strong and with it the threat of inflation and that was the trigger for tighter monetary policy. The impact of these rising interest rates spread over 3 to 5 years was to depress sales as the chart below shows. It is somewhat striking to see the degree of correlations between these two discrete periods. The period in the 90's did see some recovery towards the end of the period but the first 12 months was generally depressed. In the case of the 2000's the long term impact (heavily influenced by the GFC) was a significant depressing of sales volumes. When it comes to property prices as measured by the median price the trend across these two discrete periods again shows a high degree of correlation. Both periods witnessed a decline in the growth of property prices. It was only towards the end of the 5 year period in the last decade that prices actually went into negative growth. The two periods in which interest rates fell were short-lived, representing just 17 months in the end of the 90's and just 12 months in 2008/9. Both of these periods came about as a function of the necessary reaction of the Reserve Bank to external stimuli - in the late 90's it was the Asian Economic Crisis and a decade later the Global Financial Crisis. The impact of these significant cuts in interest rates was to stimulate property sales as the chart below shows with again a striking correlation between the two discrete periods. When it comes to property prices the fact is the data shows that the falling interest rates aided the stimulation in property prices. In the most recent period of 2008/9 dragging prices back from actually falling, whilst in the 1998 period it managed to stave off what could have been and was very close to falling prices. The past 20 years have witnessed two coinciding periods when interest rates showed significant volatility, in the space of 2 years interest rates rose and then fell to return to the prior period rates. These instances occurred during the early years of the last decade and were triggered largely by global economic events. Clearly this degree of rising and falling rates can lead to uncertainty. In the case of property sales, volatility in interest rates seems to establish no clear correlation between the two periods nor in fact any clear direction of the market. The earlier 1998/9 period saw sales fall and then recover, almost in line with the interest rate hike and then cut; as for 2002/3 sales fell but with some rebound. As to property prices during this volatile period, again as with sales volumes the correlation between the two periods is not clear and the trend seems to show no significant movement up or down. The 2002/3 period did see a very marked rise after 12 months as interest rates fell; this was though the beginning of a very strong bull run on prices through to 2007. So whilst by no means scientific, there is clear data to support the view that the occasions when interest rates are rising is a time when property sales ease and prices slow; whilst interest rate cuts stimulate property sales and inflate prices. However uncertainty in interest rates tends to leave the market marking time. With the Reserve Bank clearly signalling that we are about to experience a period of 2 to 3 years of interest rate rises it would seem to be fair to say we will see sales volumes ease and price growth slow. Property price expectation weakens as property sales rise - why? At times I have to confess I get a bit lost in analytics and data analysis, trawling through the reams of property data available - I love to seek out trends and then try and interpret the correlation. I have come across just such an interesting correlation and am curious to postulate some rationale behind the correlation and see what others think. The correlation is that there is an inverse relationship between property sales volumes and the alignment of the asking price of property to the eventual sales price. That is to say that as sales volumes rise then the differential between asking price and selling price lessens, whereas when sales volumes fall the gap widens. Or put another way, sellers seem have a more realistic price expectation in a rising market! - not what I might have thought. I was prompted to this correlation when examining the current trend of asking price to sales prices over the past 5 years. The source data I have looked at is the Stratified Price Index from the Real Estate Institute and the Asking price from the Realestate.co.nz NZ Property Report which uses a 80% Truncated mean price. I have chosen to examine the Auckland market specifically as it has witnessed sizeable movements in both volume sales and prices over the past 5 years. In the past year the asking price for Auckland properties coming onto the market has actually fallen below the sales price, or put another way the pace of sales prices has outstripped asking price. This was the beginning of the data trend analysis. I next added the data of property sales over the period and tracked this against the variance of sales price to asking price. The red line represents sales tracked on the left hand axis whilst the grey line tracked on the right hand axis shows the percentage variance of sales price to asking price with the parity level marked at the 0% horizontal line. A very clear correlation is seen albeit the monthly fluctuations make the chart a trifle messy. Applying a 12 month moving average to the data sets though provides a clearer picture of the correlation. 1. Property sales are a lead indicator of price movements and as can be seen there is a lag in the trend correlation of anywhere from 3 to 9 months. If asking prices are set based on current market demand and sales prices follow by a lag then the gap between asking price and sales price will narrow as sales consistently grow. 2. Asking prices are set more by agents than by vendors, as sales pick up agents are motivated to sell and therefore set more realistic expectations of asking prices especially at the early stage of sales growth. On the downside as sales fall agents hold out for a more optimistic selling price than the market would indicate. 3. In Auckland as we are so often told a majority of property is marketed without a published price and often for sale by auction. The asking price is created by the website search price which is not public. Therefore it could follow that as auctions become more popular (as sales growth takes off) the search price is set at the bottom end of price range expectation to attract attention which leads to this narrowing in the gap. Conversely the fall in sales drives less auctions and more realistic search range pricing. 4. The widening of the gap between asking price and selling price is possibly explained by the fact that expected asking prices still reflect an optimism by agents to see price continue to rise when the reversal of sales growth actually seeing property prices fall. Whatever the explanation I think it is interesting to see just how close asking prices have come to the selling prices - the property sales have though started to tail off and therefore the acid test will be if the gap between asking price and sales price widens driven by continuing growth in asking price expectation. In the space of just 5 years the Auckland property market has risen by 52%. Back in November 2008 the Stratified median price in Auckland as measured by the Real Estate Institute was $435,700. The November sales data for 2013 shows that median price is now $664,100. Five years, a total increase of $228,400, that's more than the average annual earnings in Auckland over that period! As ever peaks and troughs in property markets are only ever able to be judged in hindsight, but buying a property in November 2008 now seems like a smart move, although at the time there would be many calling it a risky move given the trend of declining prices at the time. The question often asked in relation to the prediction of property prices is how best to judge future prices based on past trends. This is, as often stated, not an exact science. However with over 30 years of data from the Real Estate Institute it is certainly worth exploring. For comparisons to be made from one time period to the next requires a degree of normalising; which when it comes to prices, whether that be for property or households goods means adjusting for the impact of inflation. The general rise in prices as a function of inflation is far different from specific price rises caused by pressure of supply or demand, as is often the case with property. Using the Reserve Bank Inflation Calculator and applying it to the monthly data of Auckland Stratified Property Prices produces this chart below which shows a somewhat different picture as to price movement for the past 6 years. The rise of 52% in today's dollars equates to a 37.8% increase when adjusted for inflation - still a significant rise over 5 years, however as can be seen almost all of that rise occurred in the past 2 years, as before that property prices adjusted for inflation hardly rose at all. This steep rise of the past 2 years is pretty significant. 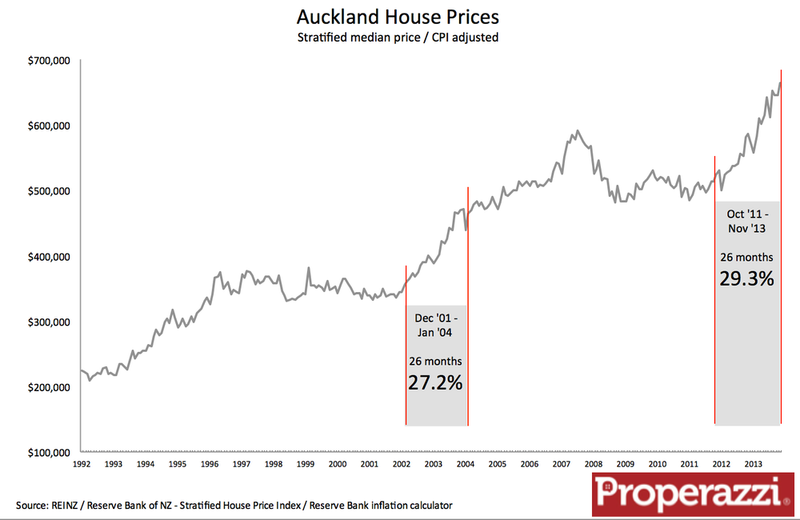 From the starting point of October 2011 - 26 months ago the CPI adjusted Auckland median house price has risen by over 29%! I thought it would be interesting to compare this rate of increase with the last time we experienced a very active period of house price growth back in 2002. That point was the start of what became a relentless rise which over a 5 year period saw property prices rise close to 70% in real terms, only ending with the start of the Global Financial Crisis. Taking just the comparable 26 month periods which commenced these periods of steep growth the period of December 2001 to Jan 2004 was a 27.2% rise. So by this measure we are current witnessing a faster rate of property price appreciation than the period cited by many as a period of rampant property inflation that we would never see the likes of again! The question then has to be asked as to the likelihood of the property price appreciation continuing for another 3 years from now based on the parallel of the past 26 months of the 2001 run in property prices? As ever that is a very hard call to make. The factors driving the rise in 2003/4 were very strong global economic activity backed by a strategy of targeted low interest rates as the US Federal Reserve sought to ensure the US economy staved off the recession and impacts of 9/11. Technology was driving prices lower and the powerhouse growth of China and the rest of BRIC countries. That was 2003/4, as to 2012/13 the world is emerging, still slowly from the GFC, the US economy and the British economy are picking up steam and the forecast for the NZ economy is for very strong growth, some say growth not seen since the 1970's. Add to this the migration expectations as they are likely to be felt more strongly in Auckland and then overlay the ever present issues about new construction of residential property and you have the seeds of strong factors for continuing property demand. Finally the cost of finance is targeted to rise, certainly a dampener on property prices, but when and by how much is debatable. In relative terms a 1% or 2% increase in mortgage rates will be significant when the current rate of 6%, but finance for property at 7.5% or 8% is in the long term still considered manageable. In the short term the trend of property prices will likely be a slowing of growth. That is to say that when property prices take off as they have over the past 2 years the rate of growth has to slow as rises of 15% or put to 20% are unsustainable - a 10% or below rate of annual growth is more likely - still seeing prices rise. The chart below tracks the first 36 months of the property rises from December 2001 as measured as year on year growth and then tracks the 26 months of the 2011 to date run. An similarity of price growth trend - but very likely to tail off in the next 12 months. 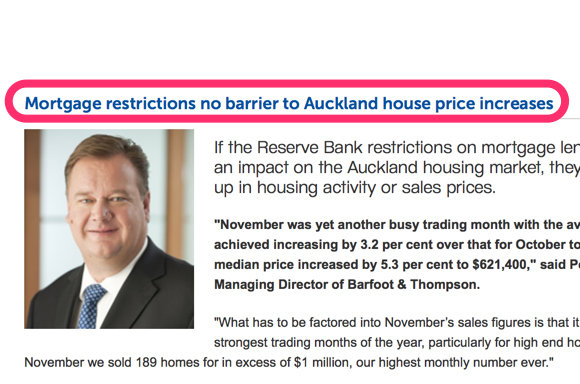 The headline from the Barfoot & Thompson's November Market Update stated confidently "Mortgage restrictions no barrier to Auckland house price increases". The commentary then went on to say that the LVR impact has yet to show up in housing activity (sales) or sale prices. The data then stated that both average sale price and median sale price were up again as highlighted by the chart below. A cause of the further rise in sale price for November was the record level of sales of homes over $1m - 189 of them a record for the company. In November last year that total of sales over $1m was 129, a variance of 60. That increase in sales at the top end would impact the average price but the median price would be less impacted. However what is more likely to impact the median price and the average price was a variance of 97 in sales of lower priced properties. In November 2012 B&T sold 292 properties below $400,000 this November that number was 195. Seen as a proportion of all sales in the month as the chart details below the drop is significant. Clearly the monthly drop in November was significant but the trend has been established for quite a few months now as the lower end of the market as served by B&T in Auckland (who represent around 40% of the market) has fallen away. The November one month fall from October this year is more significant than either of the past 2 years indicating that the impact of the LVR restrictions are being felt through the numbers. These detailed sales by price bracket data is provided by B&T on their site and I applaud them for that openness, something that we have seen withdrawn by the Real Estate Institute who used to make such data accessible but now decides to charge fees to access. As I stated last month in the article "The LVR speed limit - crippling or merely cooling the market"
We will need to wait until at least the November sales figures and more likely until the new year as well as to study housing loan approvals before the definitive statement can be made as to the true impact on the changes as a consequence on the high LVR restrictions, indications certainly show an impact, though that impact in sales is not huge as yet. Here we have the first indicator through the Auckland market from B&T - not featured in the headline, but buried in the detail. As I said the November sales figures should give us some indications. Here is some such data - will we get detail from the Real Estate Institute in their data or will the headline smooth over the facts? Property as we all know is at its core, a fundamental of Maslow's Hierarchy of Needs, the primary need for shelter. Far more important than even safety and self-esteem and self-actualisation. For this reason property exhibits the same fundaments of economics of supply and demand. When the supply of a good (in this case property) is limited, price go up as we have seen in Auckland as supply of property for sale has been constrained whilst demand has grown faster than supply and the access to finance has been relatively easy and cheap. These latter two components also impact the economics of property as does the substitution of property options between renting and buying. If the cost of buying becomes affordable and the access to finance is available then people will buy, equally if it is cheaper to rent and finance becomes less accessible rental demand will grow and consequentially rents will increase. This is all logical. Let's now examine these principles when applied to the constant media story of 2013 - the dire housing shortage in Auckland. We hear weekly how Auckland needs 20,000 or maybe 30,000 new homes to be built almost immediately as well as 350,000 homes over the next 25 years to solve the housing crisis. If the housing crisis is so dire and is the reason why property prices of houses for sale are growing at double digit levels, then why is it that rental prices of property in Auckland are not growing. The chart clearly shows that whilst property prices have increased by over 45% since the start of 2009 rents are up just 15% and the past 18 months have barely seen any change. 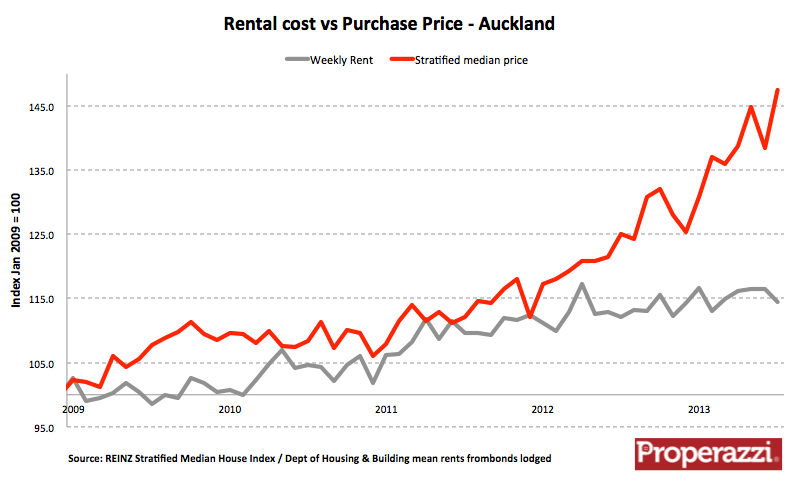 If Auckland really had a housing crisis then rents would be increasing - it's the same economics of supply and demand. To look for proof, look at the same chart for Christchurch below. The fact is that Christchurch has a real housing crisis. There are too few available properties to meet demand as a consequence of the earthquake and the subsequent rebuild programme. In that market both rents and prices are rising, almost in alignment. Now look at Wellington, a market that is not suffering a shortage of property and we see an alignment of rental price appreciation to property sale price appreciation. This analysis would seem to support a view that the recent appreciation in property prices in Auckland have been fuelled by speculation. With easy access to low cost finance over the past 2 years people have returned to property assets, this has been especially true of rental investment and property re-development. Investor growth has actually increased the supply of rental properties, which has as a consequence has maintained fairly stable rental prices at and contributed to a further tightening in the property-for-sale market through effectively taking home-owner stock out of the market. To this has been added inbound migration demand into the region from both domestic and international sources which has often been accompanied by higher equity capacity which has only further stoked the property price inflation. Is property price inflation in 2013 a repeat of 2003? Ten years ago in 2003 NZ was in many ways the same and yet so different. Helen Clark was PM with Bill English as leader of the opposition (replaced later in the year by Don Brash). Top film of the year was Whale Rider, whilst NZ population tipped past 4 million. It was a sorry year in Sport with Team NZ loosing 5-0 to Alinghi in the America's Cup and the All Blacks ending up loosing to Australia in the Semi-Final of the Rugby World Cup. In the property market things were to say-the-least active. Sales of property were well on their way to a new all time record of over 120,000 in the year (2013 looks set to be around 81,000). As for prices; at the start of the year the average property sold for $203,550 (Stratified median price) and by the end of the year it would have cost $248,450 - a 22% increase. The largest single year increase in prices on record of the past 20 years. 2003 was the year when property prices really took off. A year earlier at the beginning of 2002 the stratified median price for a NZ house was $177,850. Over the next 5 years and 8 months prices would more than double, rising 131% to $379,075 by the end of the bull run in September 2007. So the question remains - are we about to witness a similar stratospheric rise in house prices? A good indication can be seen in a chart I have developed which tracks the cumulative rise by month for each year of property prices indexed based on the December price in the preceding year. This model provides a means to directly compare each year side-by-side. The series of charts below track the Best and Worst years of the past 20 years as well as the Median and the current year to date. All charts utilise the REINZ Stratified Median Price Index thereby presenting data for NZ / Auckland / Wellington / Christchurch / The North Island excluding Auckland & Wellington and finally The South Island excluding Christchurch. 2013 is clearly not close to 2003 in relative growth rate although it is well ahead on the median. The month of August certainly saw a significant up-turn. A very interesting picture in Auckland. 2013 is certainly shaping up to be similar to 2003, in fact August has taken the annual rise so far ahead of 2003; however Auckland saw the highest rise in 1994 not 2003 and so far 2013 is behind that rise. 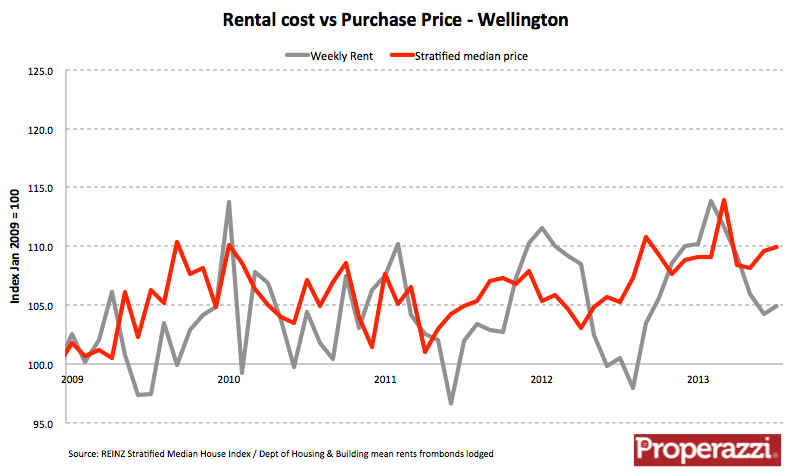 It certainly looked to be a repeat of 2003 for Wellington in the early months of 2013 with monthly growth tracking almost exactly inline until May when prices came back and now are tracking exactly inline with the median. Interesting again for Wellington the best performing year was not 2003 but 1997. In the Garden City 2013 is turning out nothing like 2003, which for the city was the best performing year of the past 20 years. After 8 months cumulative price rises in the city are exactly in line with the median rise. 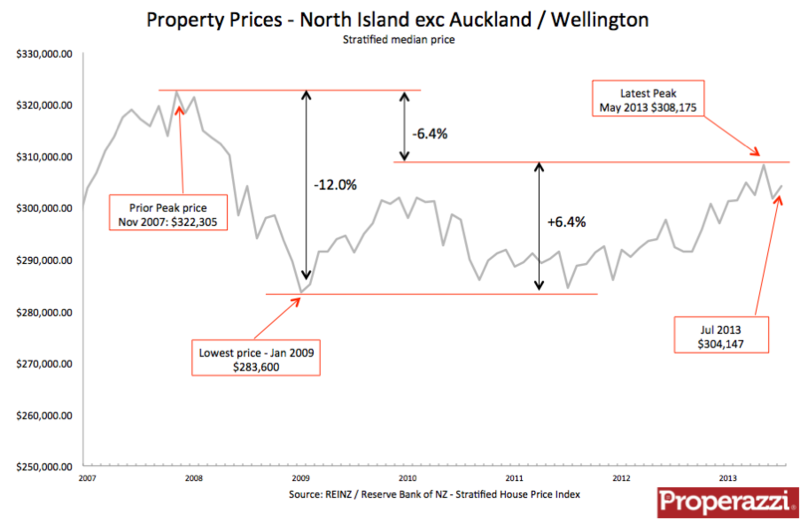 Interesting that the remainder of the North Island regions saw the peak of property prices in 2005 rather than 2003. For this area of the country 2013 looks nothing like 2003 - another very average year of cumulative increase of less than 4% so far. 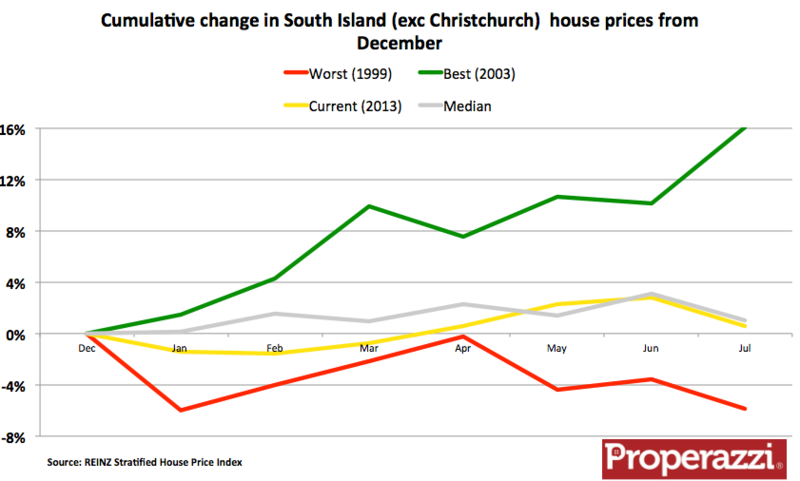 Rather as with Christchurch the remainder of the South Island is no where near 2003 pace of property price appreciation. The current year is tracking inline with the median and showing barely 1% cumulative rise this year so far. The quote for the week and possibly the month for me was made by the QV research director Jonno Ingerson. On Radio NZ he stated that "the already heated house prices should continue to rise strongly for another 15 months" - Wow! Property prices stated to rise in January 2011 - they have therefore been rising already for 30 months; could we possibly see continued growth in prices for another year-plus taking the full run of prices to 45 months! - that is optimistic. His justification seemed to be - previous up cycles tend to be of this same order - is that really a compelling case for a forecast. I always saw QV being somewhat bearish when it came to property reporting relying as it does on data analysis and without a vested interest group to serve, but clearly that has changed. Counter to this more bullish prospect presented by property reporting entities, other notable commentators (Bernard Hickey & Shamubeel Eaqub) rightly believe too much focus as ever is applied to the Auckland property market as if it is representative of the whole country. The excellent article in the NZ Herald by Bernard Hickey recently titled 'Provinces left behind' summed up the fact that this property cycle has had no effect on provincial NZ. 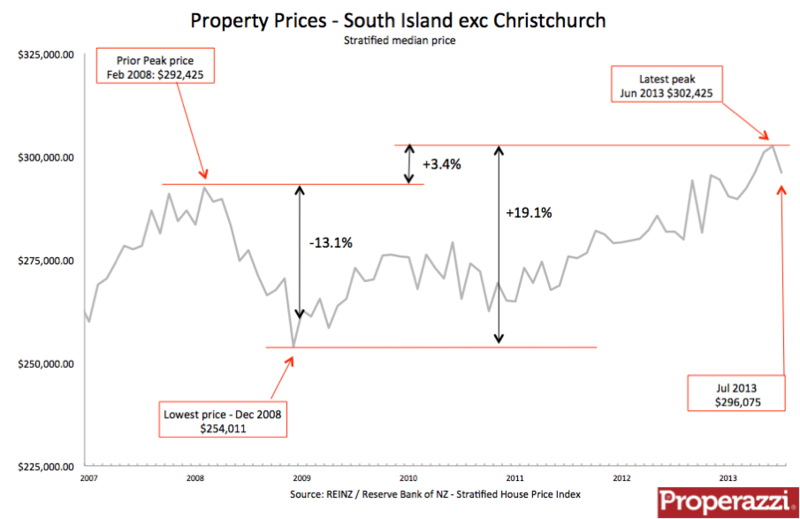 He quotes that Auckland prices have risen 13% from their 2007 peak in real terms with Christchurch up 5% but for the rest of the country real prices are down 20% in real terms and still falling. Such figures warranted more investigation. Taking the REINZ Stratified Price Index data I delved beyond the usual stats for Auckland, Wellington and Christchurch and looked at two sub sets - 'Other North Island' which effectively measures the North Island excluding Auckland and Wellington and 'Other South Island' which excludes Christchurch from the stats from the mainland. The charts below ably speaks for themselves - this property cycle has yet to be really felt by those provincial regions.